Essure is a permanent, non-surgical female sterilization process in which metal and fiber coils are placed in a woman's fallopian tubes. The placement generates scar tissue, such that sperm is stopped from getting to an egg. The FDA approved Essure in 2002, but since then it has received thousands of complaints about Essure-related symptoms, including pelvic pain, unintended pregnancies, abnormal bleeding, organ perforation, and even death. In 2016, a black box warning was placed on Essure, and the FDA has ordered that Essure must only be sold through doctors who ensure that women are fully informed about the dangers of Essure. In 2018, Bayer announced that it would stop selling Essure. 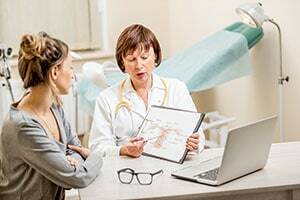 If you were injured or a loved one was killed by Essure placement, you should consult the Essure injury attorneys at Moll Law Group about the viability of a product liability lawsuit. What are the Chances of Getting Pregnant With Essure? Essure is a form of permanent birth control that cannot be reversed. However, once the Essure coils are placed in the fallopian tubes, it still takes about three months for Essure to stop a pregnancy. You are supposed to use another type of birth control to stop pregnancies for six months after the procedure, although in some women it takes about three months for the Essure system to stop pregnancies. The risk of pregnancy if the coils have been properly placed is 0.1%. It is very rare to get pregnant while on Essure, but there are certain situations in which it may occur. The pregnancy could have occurred before the procedure, the coils may not have been placed properly, or backup contraceptive methods may not have been used in the 3-6 months after the placement of the coils. It is wise to get confirmation from the doctor before going off other birth control. There is a higher chance of an ectopic pregnancy after the Essure procedure. Can Essure Stop Your Period? Essure is not supposed to affect your monthly cycle. However, some women have a heavier or lighter period after undergoing the placement of the coils. Sometimes stopping hormone-based birth control after 3-6 months can result in an altered period. You should contact your doctor if your period stops after the Essure coils are placed. What is the Failure Rate of Essure? Essure is popular because unlike tubal ligation, it does not require a surgical incision. The manufacturer of Essure has claimed that it is 99.83% effective at stopping pregnancy over a five-year stretch when the approved instructions are used. However, Essure has been found to be less successful at stopping pregnancies than tubal ligation. Unwanted pregnancies have been reported. Is the Essure procedure painful? The Essure procedure can be painful for some women. There may be mild or moderate discomfort, cramping, and pain during the procedure. Sometimes, after Essure is placed, there is chronic pelvic pain. Our lawyers are aware of thousands of patients who have reported severe pain, in addition to organ damage, after using Essure. Some families have reported patient deaths. It is alleged that women who complained that they were suffering debilitating pain during Essure's clinical trials were removed from the studies. This alleged removal may have skewed trial results during the pre-approval process. There may be manufacturing or design defects in the Essure product that make it unreasonably dangerous. Many women have sued Bayer in product liability lawsuits in connection with pain and other problems associated with Essure. Previously, federal law had shielded the manufacturer from state product liability lawsuits because of the special federal regulatory approval process that it had gone through. However, more information is now known, and Bayer is no longer shielded from liability. If you have experienced significant chronic pelvic pain and other problems and believe that they resulted from Essure, you should consult the product liability attorneys at Moll Law Group. Contact us at 312.462.1700 or via our online form.